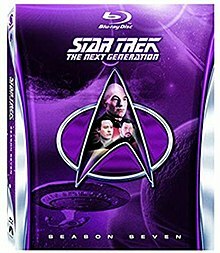 The seventh and final season of the American science fiction television series Star Trek: The Next Generation commenced airing in broadcast syndication in the United States on September 20, 1993, and concluded on May 23, 1994, after airing 26 episodes. Set in the 24th century, the series follows the adventures of the crew of the Starfleet starship Enterprise-D. The season begins with the crew defeating Lore and his group of rogue Borg, resulting in the disassembly of Lore. It continued this theme of family history with most of the episodes. After dealing with Lore, Data also confronts the realization that his "mother" is still alive ("Inheritance"). In "Interface", Geordi attempts to save his mother from a damaged ship and is forced to deal with his loss. Worf meets a future version of his son, Alexander, in "Firstborn" and his foster brother in "Homeward". Both Troi and Dr. Crusher confront old family secrets in "Dark Page" and "Sub Rosa". Picard also faces challenges with a son he never knew he had in "Bloodlines" and his relationship with his family – past, present, and future – in the series finale "All Good Things..."
The series ends with Q concluding his trial of humanity, giving Picard an opportunity to save all of humankind. This season was nominated for a Primetime Emmy Award for Outstanding Drama Series, making Star Trek: The Next Generation the first (and currently, only) syndicated series to be nominated for the award. The Borg are being led by Lore. Data falls under his control by being fed negative emotions. Worf and Troi reluctantly play host to two Iyaaran ambassadors while Picard crashes in a shuttle with another Iyaaran. He is rescued by a human female who exhibits strange behavior. Geordi tries to rescue his mother's starship via a remotely controlled probe. The Enterprise crew investigate the apparent murder of Captain Picard during an archaeological trip. Riker is kidnapped by mercenaries and finds Picard working as part of their crew. Picard and Riker help mercenaries collect archaeological artifacts to prevent an ancient Vulcan weapon from falling into the wrong hands. Data experiences strange dreams while the Enterprise has issues with its renewed warp core. But all is not as it seems. A psychic breakdown puts Lwaxana Troi in a coma and Deanna works to save her life. This episode features a young Kirsten Dunst playing the little girl Hedril. Reclusive aliens imprison Picard and Dr. Crusher on charges of espionage. Experimental implants linking their minds telepathically cause them to face their latent feelings for each other. A pair of scientists show that warp drives are harming the fabric of space. Data encounters a woman claiming to be his "mother". Worf finds himself randomly shifting between alternate realities, after winning a tournament and celebrating his birthday. Riker's former Captain boards the Enterprise to retrieve the USS Pegasus. Picard investigates the circumstances of its loss and finds that there has been a cover-up. Features Terry O'Quinn as Admiral Eric Pressman. Worf's human foster brother violates the Prime Directive to save a doomed primitive race. Despite being told by Worf, not to interfere, he decides not to listen, and the Enterprise is forced to move them to another planet via the holodeck. Based upon material by William N. Stape. Dr. Crusher attends her grandmother's funeral and takes on an unusual family tradition. She finds that the house is inhabited by a spirit who is 800 years old, and was her grandmother's lover. Based upon material by Jeanna F. Gallo. Junior officers buck for promotion as one of them is assigned the dangerous task of helping a Cardassian spy. Data loses his memory after retrieving radioactive fragments on a planet's surface and endangers the humanoid settlement he encounters, while Deanna studies to become a bridge officer. The Enterprise finds an ancient library that recreates its civilization by taking possession of Data and transforming the ship. Data exhibits symptoms of schizophrenia. Deanna investigates the suicide of a crewman and uncovers a murder that took place during construction of the Enterprise. A routine medical treatment inadvertently creates a virus that begins to de-evolve the Enterprise crew while Picard and Data are on an away mission. This is the first and only episode to be directed by Gates McFadden, who plays Dr. Crusher. Wesley considers his future as the Enterprise is ordered to remove Native Americans from a planet that is about to fall under Cardassian jurisdiction. Guest stars Richard Poe as Gul Evek, Wil Wheaton as Wesley Crusher and Tom Jackson as Lakanta. Final appearance of Eric Menyuk as The Traveler. Based upon material by Shawn Piller and Antonia Napoli. Worf attempts to convince his son Alexander to embrace his warrior heritage. Guest star James Sloyan as K'mtar. DaiMon Bok (guest star Lee Arenberg) returns to exact revenge on Picard by trying to kill the son Picard never knew he had. The Enterprise becomes an emergent intelligence. It is discovered that the ship is creating a new life form via the holodeck characters. Lieutenant Ro graduates from advanced tactical training and is sent by Picard to lure Maquis terrorists into a trap. Guest star Richard Poe as Gul Evek. Picard finds himself being transported between three time periods, thanks to Q, with a spacetime distortion that threatens to destroy reality growing larger in the past, and smaller in the future. Originally shown as a two-hour series finale, but in syndication is shown as 2 separate episodes.